Meet Sophia! 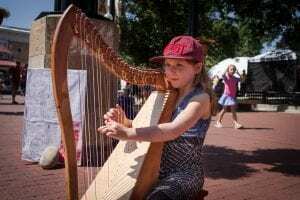 Sophia is an 8-year-old harpist and by far one of the youngest performers on the Pearl Street Mall. Sophia’s been studying the harp with local music teacher Margot Krimmel after getting the harp as a Christmas present last winter. Sophia’s father, Alexander told me he had a sense she would be musically inclined and after showing her a picture of a harp, her decision was made. Make sure to drop a dollar in Sophia’s basket if you see her performing, she’s saving up for her new pedal harp!